Hurrah! The final pieces have arrived today. My 3D-printed parts came a few weeks ago, which included an iris diaphragm, some test pieces to help me in future designs, and the first draft of my robotic arm. Today, the motors for my robot arm arrived from Seeedstudio.com (great site, with lots of cool electronic goodies). I’ve always had an interest in robotics, but I always got stuck when it came to the mechanical fabrication. What was I to do? I don’t have access to a machine shop, and I am not that good at making anything of quality with just my current set of tools. There are robotic kits out there, but I feel like it would defeat the entire excitement of design to buy a robot kit where all you do (mechanically) is bolt the pieces together. I want to design the entire thing from the ground up. Particularly, I want to design the mechanical assembly from scratch. Well, I finally have a method: 3D printing. 3D printing is an amazing branch of fabrication. The workings of a 3D printer aren’t very different than the workings of your home inkjet printer. Just imagine, if you will, that instead of printing a thin layer of ink onto your paper, that you printer printed a thin layer of some solid material instead. Well, if you put the piece of paper back into your printer, and printed the same thing again (and did this over and over several times) the thin layers of material would build ontop of each other, and a 3D solid would form. This is effectively how 3D-printers work. SLS (Selective Laser Sintering), for example, works by depositing a thin layer of powdered material onto the work surface. A computer guides a laser over the poweder, melting and solidifying selective parts of the powder. When it is done, another layer of powder is deposited, and the laser melts parts of this next layer, which will also merge with the melted parts of the layer below, building a sold. When this process finishes hundreds of thin layers, the solid part can be removed from the powder. This process can get quite costly. The cheapest commercial-grade printers available start at around $15,000. Most businesses that offer 3D-printing are targeting companies that don’t mind spending several hundred dollars on a single test-print to troubleshoot a design. Definitely not an option for an individual like myself. There are alternatives for the hobbiest, like makerbot, which is a $500 printer that prints low-resolution ABS, but even that entry cost is outside my current budget. Thankfully, I discovered shapeways.com. Shapeways is a 3D-printing company in Europe that targets the hobbiest/individual/home-business. They offer a variety of materials (including such options as stainless steel and colored sandstone). Their prices are reasonable, and shipping is included (which will be a big plus when I move back to Alaska). These parts were printed as clearance tests. The two pieces on the far left are to test slot widths. The piece in the middle is meant to see how close two pieces could be printed before they fuse. 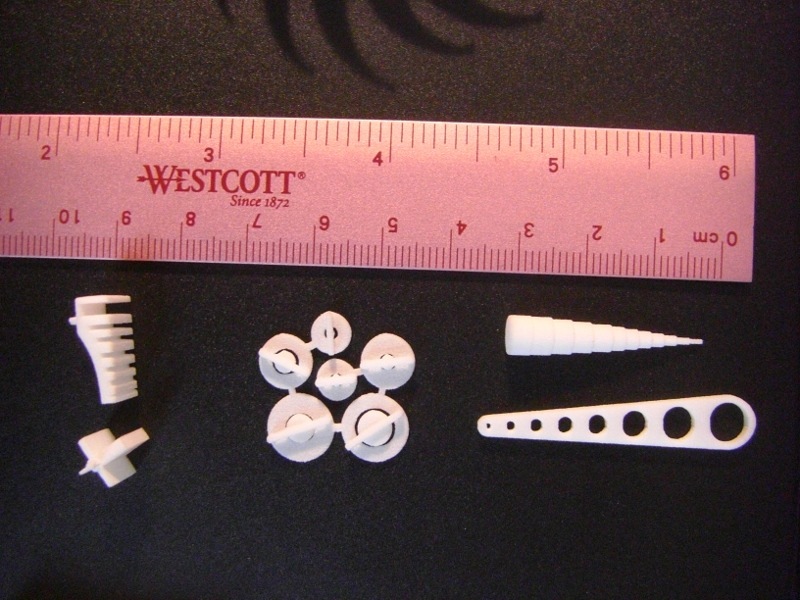 The part on the right is to test the fit of different diameter pegs in different holes. This is my first attempt at a printable Iris Diaphragm. The design failed due to overgenerous clearances on my part. Oh well, something to change for another draft. And here is my pride and joy. It isn’t really a robot “limb”, but it has some basic elements (rotation, linear actuation, gear reduction, etc) that would be needed in a limb. 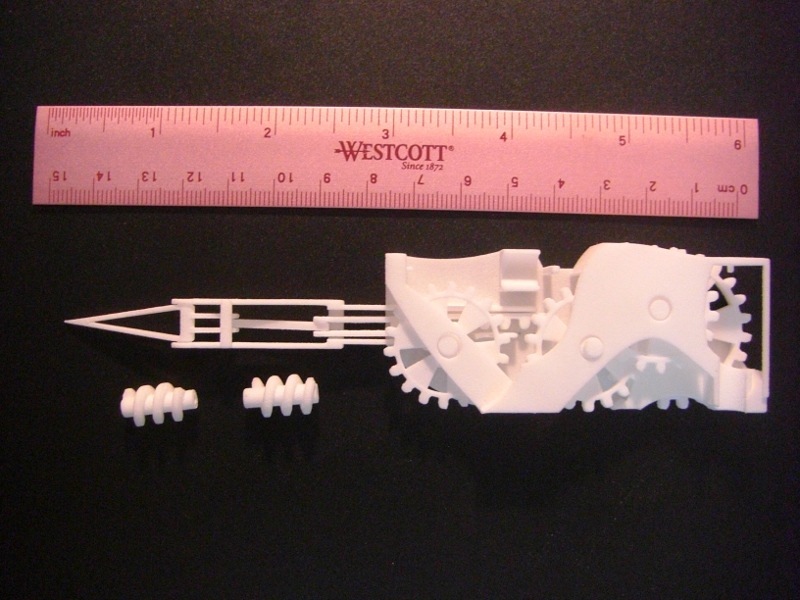 All of the parts were printed separately, but designed to snap together. The above picture shows it assembled, except for the worm gears, which need to be joined to the motors before mounting. The gear assembly on the right will allow the entire “limb” to be rotated about that large gear on the bottom. The small gear on the left pushes the linear gear which actuates the pointed tip on the far left. You can see the two slots where the motors and worm gears are to be installed. I count it as a success. In the second part of the video, you can see me unjamming the gear to get the tip to actuate again. The other gear assembly also had problems, but I was able to keep the problem gear from popping out of its bearing by placing a little kneaded eraser. Tighten up the tolerances (my peg-and-hole test-piece will come in handy). Figure out a surface hardening treatment. The plastic is cheap, and I would like to keep using it, but if it is going to be a bearing surface, it will have to be able to handle the wear. Figure out some surface treatment to help smooth the surface. Refine the linear gear to prevent jamming (although tightening up tolerances should fix this). Figure out an analog position sensor for feedback into control electronics. My goal here would be to make my own servo control, but with less expensive ($1.50) motors and integrated (smaller–well not really) gearboxes. This entry was posted on Monday, February 22nd, 2010 at 20:01	and is filed under Mechanical. You can follow any responses to this entry through the RSS 2.0 feed. You can leave a response, or trackback from your own site. Amazing! Once you’re happy with it let me know and I will blog about it on Shapeways. Excellent. It looks great! …makes me want to pull out my old robot projects, too! I’m very interested to know some detail about what you discovered with your test pieces. How tight are the fits? I placed my first order this week and just guessed at the hole sizes — I figured I could just clean them up if they were too small. Good idea. I might make another post tabulating the results of the test pieces. 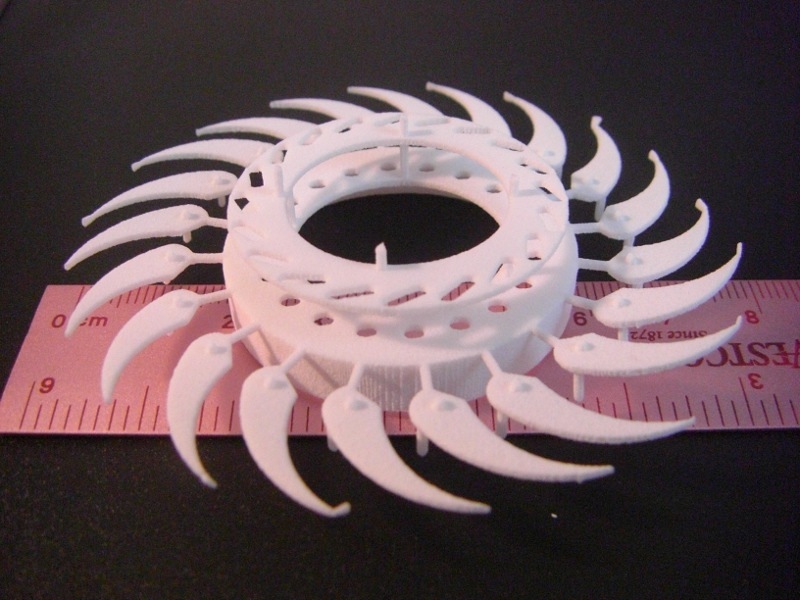 Nice Was looking for an example of a worm gear done with Shapeways and see that you did an Iris too. Well, most of the problems you mentioned stemmed from my design constraints: I want an iris that is only a few centimeters in diameter, with as thin a border as possible (the leafs are as thin as I could make them for WSF). The main reason that the above attempt failed is that the pins on each leaf weren’t long enough to stay in the guides when overlapping. I just totally forgot to compensate for it. It was a rooky mistake.